Preheat oven to 425 degrees. Place wire cooling rack on top of jelly roll pan or any large baking dish/sheet with sides (alternatively, line sheet with foil). Then, cut a slit in the side of each date and stuff cheese and two almonds inside. 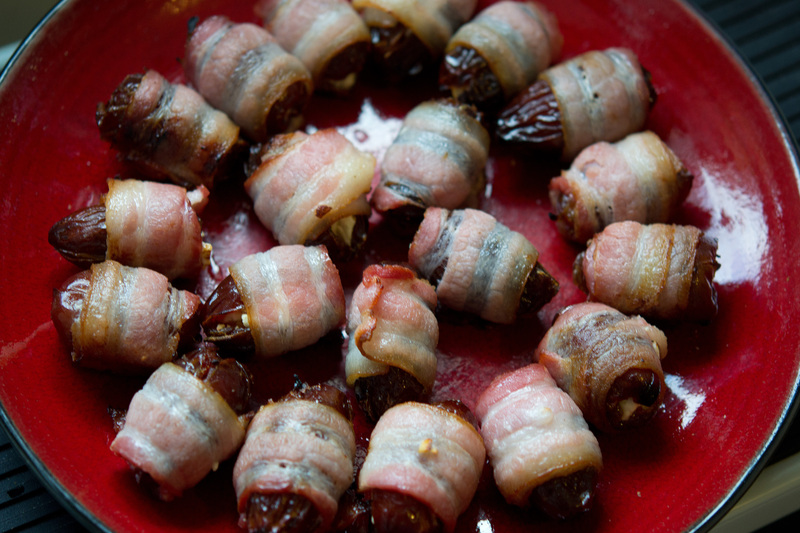 Wrap one slice of bacon around each date, sealing the cheese and almond inside using a toothpick. Place on wire rack and bake for 13-15 minutes, or until bacon is crisp (if using no rack and just foil, pull out of oven after 5 minutes and set the dates on a plate with a paper towl, wipe the pan clean to CAREFULLY remove the grease; return the dates to the pan and cook for an additional 6 to 12 minutes). Cool for a few minutes on rack before transferring to a paper towel-lined plate to degrease. Serve warm or at room temperature.